How do I start this? Hm. Counting days to her birthday, I already had in mind what caption I would write on Instagram. Or Facebook. Or up on the blog. Heh. Modern days mum... Fikir caption apa. 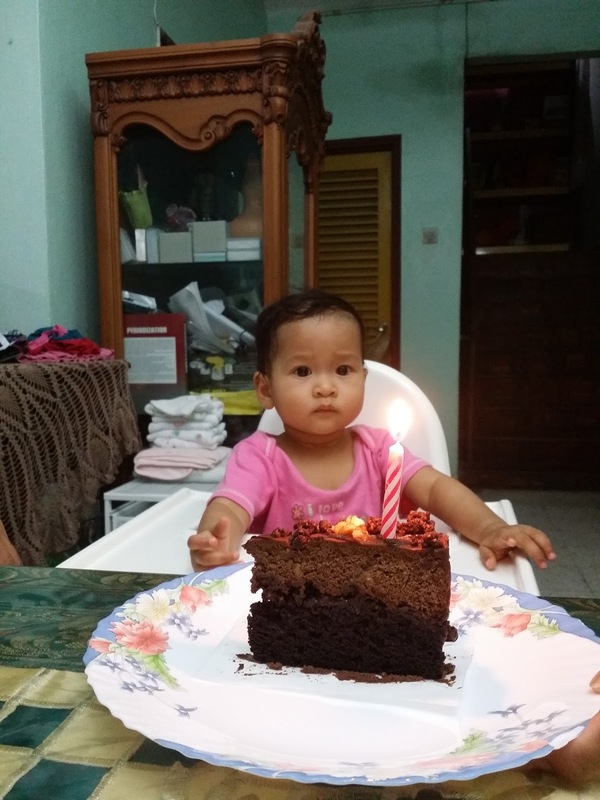 "Sofia turned one today! I AM PROUD OF MYSELF for managing to care for her one whole year though I lose myself sometimes"
But when the day finally came, I just couldn't let that out because that was not what I felt at the moment. Early in the morning I sang her a birthday song. Before she woke up, during Subuh prayers, I flashed back in my mind what happened on this day at this exact moment one year ago. My water leaked; not knowing what it was I WhatsApped Tita, what is this clear fluid flowing out like kencing since last night but I'm pretty sure it's not kencing. Iz, my mum, and Tita were alarmed while I was still relaxed not knowing it's consequence. Followed Tita's advice to go to the hospital. Eh eh sudahnya beranak that evening. Sofia likes to listen and watch the azan slot on the tv channel Al-Hijrah and Salam HD. During the Asar one on her birthday, I watched it together with her like usual, but with a different feeling. Rasa sebak. Terharu. Sedih. Felt like crying also. 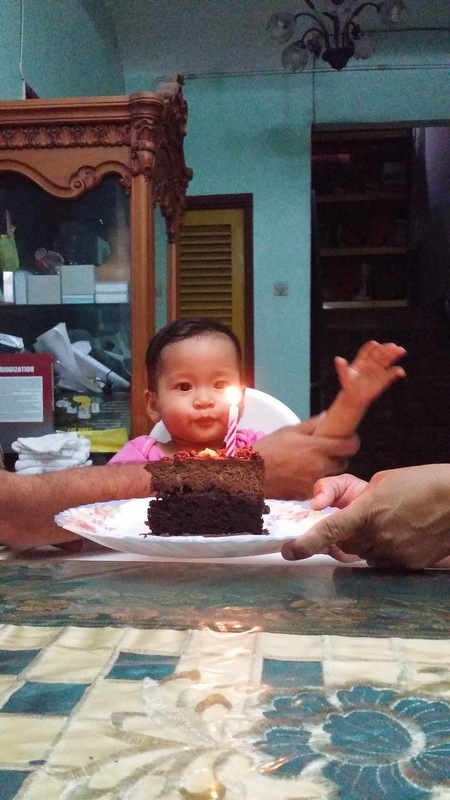 Because when Sofia was born, we heard her first cry exactly after the Asar azan ended. I was on the operation table, my mum and Iz were waiting outside. Anyway, I did not feel proud. I feel thankful. And greatly blessed by having this baby safely with me. And, for safely delivering this baby when I actually feel like dying already. Gila kan. Bukaan already 6 cm but finally had to get myself cut. 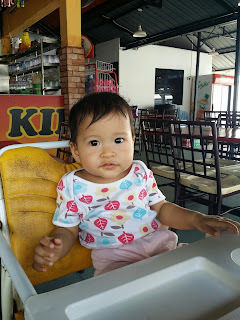 For her first birthday, we took her to Pasar Borong Selangor in Seri Kembangan to celebrate. Hahahah. Padahal beli ikan, just saying since it was also her birthday. My mum said, "Cucu kawan mak celebrate birthday kat Majestic Hotel... Sofia celebrate kat pasar..."
Told her, "Takpelah, mak. 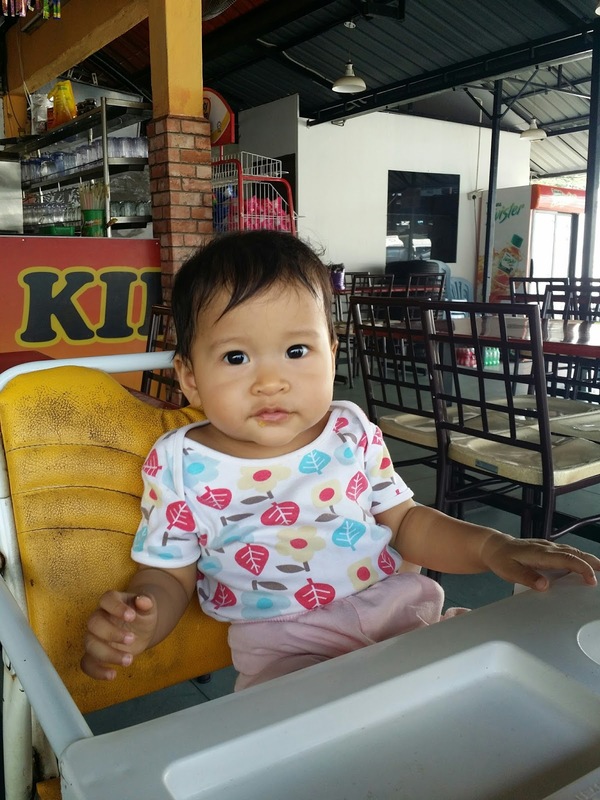 Sofia pun seronok je ni"
Because seriously, she was happy! Despite the not so posh baby chair... Hahahah. She kept smiling at people around us. We also let her drink through a straw for the first time! Sekali cuba terus dapat, tak tersedak ke apa. Pandai! I guess she must have been watching us all this while. Okay, okay... We did get her a cake. A slice of Secret Recipe Chocolate Odyssey cake, a treat from Pak Su. We also asked for one candle. We had a small celebration at home; her father, grandmother, Pak Su, and I. No fancy dress, no tiara (like I had imagined), no party hat. She was just in a pink rompers, sweaty walaupun already bathed since she just went up the stairs 3 times... 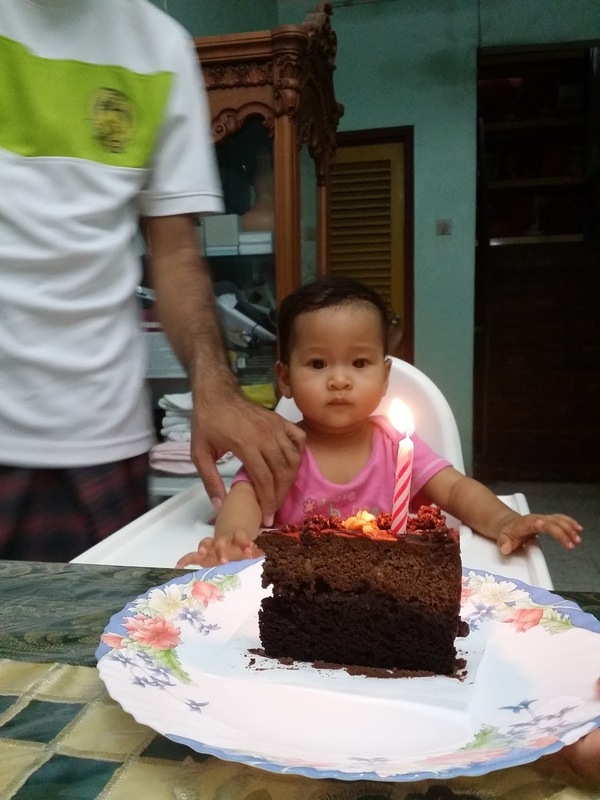 Okay la kan.
Alhamdulillah for one year with Sofia.